Elizabeth is proving to be a good helper, even at 14 months. She picks up the dirty clothes on the floor and helps me put them in the basket. She is a master at unloading the clean clothes from the basket. 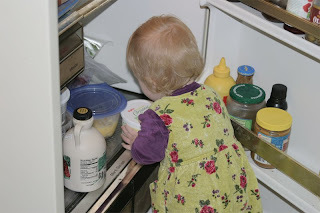 At meal times, if I give her something to put in the fridge, or when putting groceries away, she helps by putting things away on the shelves, or in the drawers when I pull them out. She really gets a kick out of helping me with real work. Little people are amazing! To bad big people don't think chores are fun. Now we just need to work on putting away toys. So true. I love it when Stephanie comes running to the kitchen as I'm unloading the dishwasher. She constantly wants to help cook, pick up clothes and wash dishes. 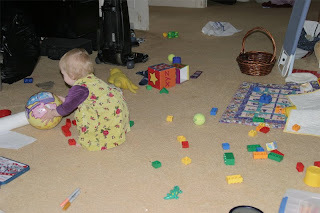 But the toys, nope, they seem to be glued to the floor!